On Saturday night, The Sunday Times journalist Mark Tighe tweeted that he had just spent three hours in the High Court. 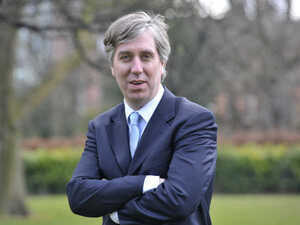 The CEO of the Football Association of Ireland John Delaney had, from 6pm, tried to secure an emergency injunction to prevent Mr Tighe reporting that Mr Delaney had given the FAI a cheque for €100,000 in 2017. Mr Tighe subsequently told RTÉ’s Morning Ireland that, at the High Court, Mr Delaney also sought damages from the newspaper for breach of privacy and swore an affidavit – which was opened to the court – claiming that he believed the only place The Sunday Times could have got information about the cheque was from his divorce proceedings. The High Court appearance followed the newspaper starting correspondence with Mr Delaney about the cheque on March 1. On Saturday night, Judge Anthony Barr ruled in the newspaper’s favour and ordered Mr Delaney to pay the newspaper’s legal costs. In his judgement, the judge said there was no proof that The Sunday Times’ source was Mr Delaney’s divorce proceedings. Mr Tighe tweeted that the judge found in their favour at 9.35pm – 20 minutes before the newspaper’s print deadline. An article about the cheque subsequently appeared in the newspaper on Sunday, explaining that the €100,000 was drawn from Mr Delaney’s account at Bank of Ireland in Waterford and subsequently lodged at Bank of Ireland in Blanchardstown, near the FAI headquarters in Abbotstown. 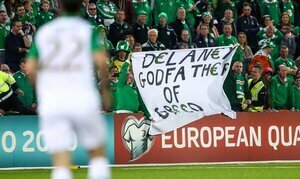 The FAI has since issued three statements on the matter, saying that the cheque was a “bridging loan” from Mr Delaney to the FAI. Yesterday, Niamh Lyons and Sean McCarthaigh, in The Times Ireland edition, reported that – since news of the cheque emerged – a whistleblower has contacted a member of the Oireachtas sport committee about a number of allegations concerning governance at the FAI. They reported that the whistleblower is preparing to make a formal complaint to the Office of the Director of Corporate Enforcement, while the politician who has received the information is going to see if the allegations can be put to FAI representatives when they go before the committee on Wednesday, April 10. 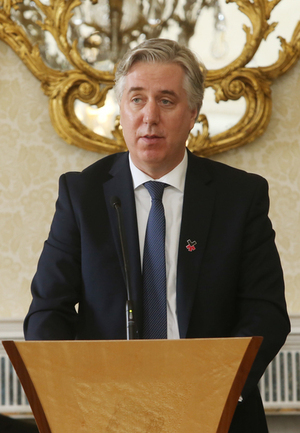 The FAI’s first statement was released around 11.40pm on Saturday night – after The Sunday Times went to print – with the FAI stating “the short-term loan [in April 2017] was required to aid cash glow on that occasion and was repaid in full” to Mr Delaney by the FAI in June 2017. 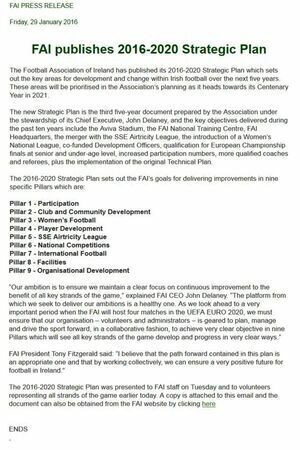 On Sunday, the FAI released a second, longer, statement – about the FAI’s governance – which also included reference to the cheque. “I have already commented on the reasons behind the loan. I acted in the best interests of the association at a time when immediate funding was needed. “This loan had no impact on the full financial position or performance of the association for the year. It was a matter of timing. “The monies received from EURO 2016 were utilised in that year’s budgets as outlined in the financial report to the 2017 AGM. “As CEO I hold regular meeting with our Director of Finance regarding the state of our finances and all items arising are conveyed to our board at our monthly meetings. The statement added that a “full media conference will be held in early April”. The third statement was released yesterday in which the association reiterated that “the bridging loan was made in the best interests of the FAI in 2017 when it experienced a short-term cash-flow issue”. In further coverage about the FAI, Neil Cotter and Craig Farrell, in The Irish Sun, yesterday reported that out of Ireland’s three main sports — football, GAA and rugby — the FAI alone needs to beg for early drawdown of State funding. 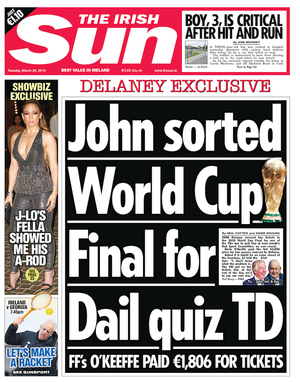 And this morning, John Hand, also in The Irish Sun, reported that Mr Delaney likely faces a €50,000 legal bill after failing in his bid to secure an injunction. Meanwhile, in late January, it was announced that the former Sports Editor at The Irish Sun Cathal Dervan had been appointed as the FAI’s new director of public relations and communications. He’s to take up the position in April after seven years at The Irish Sun. Posted in Misc and tagged bridging loan, FAI, John Delaney at 12:03 pm on March 19, 2019 by Bodger. It was a pay-day loan not a bridging loan. Johnboy gave the FAI €100,000 for three months which exactly covered his €30,000 monthly salary in April, May and June 2017, when you add in PRSI and expenses. It stinks to high heavens and the FAI saying they’ll hold a press conference in a fortnight is an insult to anyone who supports that enterprise, including the taxpayer. That and his relatively new income from FIFA being ‘donated’ to the FAI ( he is CEO). Would the reference to divorce proceedings be about to shed some light on this story. Bridging loans are very expensive. He could earn something in the region of €4,500 in interest. Interesting that he loaned the money during his divorce. Was he trying to hide money from the wife and she found out? FAI seem to enable his behavior, all you need to know is that he pays himself 360k per year and the winning team in the league get approx 100k. its an absolute disgrace and the FAI is another organization that needs to be completely overhauled. I thought for a second Delaney had a QAnon badge on his lapel!